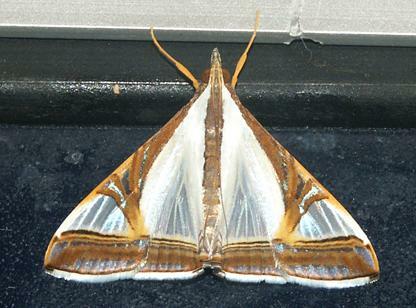 The adult moth of this species has a pattern of white and brown bands and triangles on the forewings. The hindwings are white with a brown margin. The wingspan is about 3 cms. Moths of Australia, Melbourne University Press, 1990, pl. 9.27, p. 355. LeapFrogOz, Kuranda, 2015, p. 31. Part 17 (1859), pp. 503-504, No. 13.